Thirty-Four University of Scranton Doctor of Physical Therapy (D.P.T.) students presented research at the American Physical Therapy Association’s Combined Sectors Meeting in Washington, D.C., in January and four D.P.T. students will present their research at the Novel Physiotherapies and Physical Rehabilitation Conference in London in August. 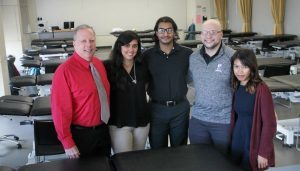 The students conducted the research and made the poster presentations with seven physical therapy faculty members, who served as their advisors. At the January conference, D.P.T. students Omar Amer, Scotch Plains, New Jersey; Berta Carmo, Parsippany, New Jersey; Dannylyn Manabat, Long Beach, California; and Jonathan Mayes, Dublin (PA) presented “The Effects of Blood Flow Restriction Therapy on Physical Performance in Adults as Compared to Standard Physical Exercise and Control Groups: A Systematic Review.” Their research was conducted with faculty advisor Peter Leininger, Ph.D.
D.P.T. students Kevin Whelan ’16, Bronx, New York; William Wilcox, Exton; and Alissa Zajac ’16, Oxford, New Jersey, presented “How Is Graded Exercise Testing Being Used in the Clinical Management of Individuals Following a Concussion: A Systematic Review.” Their research was conducted with faculty advisor Dr. Scardillo. D.P.T. students Danielle Frank ’16, Scranton; Sarah Kosik ’16, Pittston; Courtney Jo James Medfield ’16, Massachusetts; and Krista Ziegler ’16, Scranton, presented their study “The Effect of Transcranial Direct Current Stimulation on Balance and Mobility in Children with Cerebral Palsy: A Systematic Review.” Their research was conducted with faculty advisors Nicholas Rodino, D.P.T., and Renee Hakim, Ph.D.
D.P.T. students William Cavanaugh, Plains; John Huller ’16, Hicksville, New York; Nicholas Mullery ’16, Clark, New Jersey; and Joseph Pichiarello ’16, Dumnore, presented “The Impact of Home Health Care on Cost Effectiveness Compared to Other Post-Acute Settings in Individuals Status Post Total Joint Arthroplasty: A Systematic Review” Their research was conducted with faculty advisor Tracey Collins, Ph.D.
D.P.T. students Lauren Bonitz ’16, Endicott, New York; Megan Fasano ’16, Blue Bell; Meghan Goyden, Endwell, New York; and Caroline Segota ’16, Floral Park, New York, presented their study “Effectiveness of Gait Interventions in Improving Gait in Adults with Ataxia: A Systematic Review.” Their research was conducted with faculty advisor Jennifer Schwartz, D.P.T. D.P.T. students Maria Gentile ’16, Jefferson Township; Cassandra Lucke ’16, Archbald; Shannon McSherry ’16, Carmel, New York; and Devin Ryan, Blackwood, New Jersey, presented “The Effect of Equine Related Therapy on Physical and Psychological Well-Being of Older Adults: A Systematic Review.” Their research was conducted with faculty advisors Dr. Schwartz and Dr. Maida. The American Physical Therapy Association’s more than 100,000 members include physical therapists, physical therapist assistants and students of physical therapy. In addition, D.P.T. students Jamie Christensen, Branchville, New Jersey; Maura McGowan ’16, Scranton; Lindsay McGraw ’16, Lakewood; and Cory Piening, Horsham, will present “The Effect of Virtual Reality Training on Balance and Mobility in Adults with Moderate to Severe Traumatic Brain Injury: A Systematic Review” at the Novel Physiotherapies & Physical Rehabilitation Conference in August in London. Their research was conducted with faculty advisor Dr. Hakim. Story originally shared in Royal News. 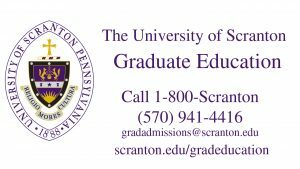 Learn more about the DPT Program at The University of Scranton here! PT and Primary Care: Should they be Linked? Check out the full story from the American Physical Therapy Association’s PT in Motion. APTA is an individual membership professional organization representing more than 100,000 member physical therapists, physical therapist assistants, and students. Visit our website to learn more about the DPT program at The University of Scranton! 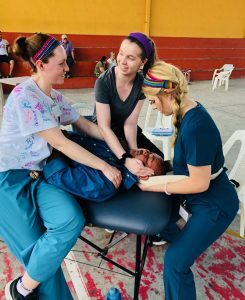 Matthew Aiken (MA) ’17, DPT expected 2020, and Erin Ciarrocca (EC) ’18, DPT expected 2021, reflect on their experiences doing service in Guatemala during intersession. Where are you going on your service trip/how long? 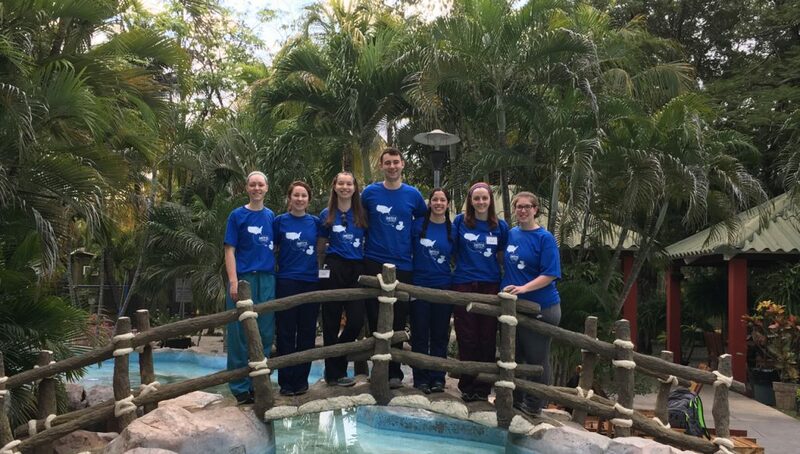 MA: Our service trip took place in Guatemala over the course of 10 days. Specifically, we stayed in Zacapa and Antigua. In a paragraph or two, describe your experience and what kind of service you did. MA: Our service trip was based out of Hearts in Motion (HIM) an organization that provides various medical services to individuals throughout Guatemala. This trip specifically focused on physical therapy. Our group consisted of three groups of physical therapy students from the following Universities: Marquette University, William Carey and The University of Scranton. Each day we traveled to neighboring towns and provide physical therapy in either a pre-existing clinic or in a “pop-up” clinic. While at the clinics we would treat various types of patients ranging from poor posture causing pain to patients with much more severe and involved neurological issues. Each day we would attempt to work in different groups of students from different schools in order to grow and learn from one another. What inspired you to go on a service trip? MA: I was inspired to go on this service trip by various people. Some of my friends have attended previous trips similar to this one and have given it remarkable reviews. Furthermore, I knew for a while that I wanted to take part in some type of service trip, this trip specifically resonated with me because it was a chance to both help other people while continuing to grow as a person and as a student in the physical therapy society. What is your biggest takeaway from this experience? MA: My biggest take away from the service trip would be the hospitality and the thankfulness each and every patient expressed. No matter how small of an issue we treated, every patient was grateful. This hit close to home for me because I feel that in our society we can sometimes get so caught up in our everyday lives and ignore what is directly around us. In addition, this trip has shown me how complacent we can become in our everyday lives if we don’t live to help others. EC: I was most awestruck by the gratitude each patient demonstrated for the care we provided. Often patients would hug and kiss us at the end of their treatment, offering a “Dios te bendiga,” which translates to “God bless you” on their way out of the clinic. As a first-year student, I initially questioned my ability to truly help these patients, but I found that their willingness to listen and learn along with a pure determination to better their own lives was so much stronger than my insecurity. They welcomed my knowledge with open arms and embraced any treatments we offered without skepticism. This type of open-mindedness and faith in the goodness of others was unlike any I had seen before and it was something I would like to model in my future career as a physical therapist. 5. What advice would you give to college students interested in participating in a service trip? MA: Do it! If there is an opportunity for you to go on a service trip, especially if the service is something you are passionate about, then I highly recommend taking the leap of faith and going for it. If you have concerns about the trip reach out to individuals who have previously attended or a moderator of the trip. We are lucky enough that our school runs numerous service trips that can cater to all types of needs. These opportunities are not always present after we graduate. Therefore, I strongly encourage, even if just a small part of you wants to take part in a service trip, go for it. EC: My advice is simple — go for it! I decided to go on this trip with only a few days’ notice, no idea who else was going, and relatively low confidence in my ability to treat Spanish-speaking patients, but within just a couple hours of working in the clinic found that the opportunity was just what I needed to grow as a student. I didn’t plan on utilizing my Spanish much, but I was immediately thrown into translating so my comfortability speaking with patients increased each day. I was able to learn from my peers and the professors, which gave me a whole set of new tools to take back for classes this spring. More importantly, this service trip gave me a chance to share the blessings I’ve been given as a University of Scranton student with people who haven’t been afforded the same opportunities. I was able to carry out my mission as a physical therapist, but also as a Christian, in serving and loving God’s children. 6. Do you think you’ll continue to serve in some way after you graduate? MA: Yes. I am already thinking about ways to continue serving both here in the United States and abroad. Since I was young, I have felt a need to help others, hence a degree in physical therapy. Over the past six years at Scranton, this calling has only grown stronger. The Jesuit ideal of men and women for others has become not just a saying, but, rather, a lifestyle that I look forward to continuing. View more about Erin Ciarrocca’s trip to Guatemala here! Check out a faculty perspective here! Learn more about the DPT program here. New Research and Technologies for DPT Students! Professor Peter Leininger, Ph.D., of the Physical Therapy Department at The University of Scranton, said there are amazing new technologies in exercise science that are revolutionizing the field, shortening the time from surgery to full recovery. Among the most exciting is blood flow restriction (BFR) therapy. Essentially, a tourniquet is wrapped around the upper or lower extremity, with controlled and monitored blood flow restriction to the muscles and joints of the knee, hip, ankle, shoulder, elbow or wrist, which greatly hastens the rehabilitation process. Dr. Leininger, the only physical therapist in the Scranton area currently certified in BFR, explained that the method started in the military, then spread to professional sports and is now being used by major universities, clinics and hospitals to treat their injured athletes. In January, Dr. Leininger and his students will present their BFR research (a systematic review) at the annual American Physical Therapy Association’s national conference in Washington, D.C. They are also completing a second systematic review studying the effect of BFR training with the older adult population. Several research studies are planned at the University utilizing the BFR Delphi unit (currently the only FDA approved blood flow restriction device). The BFR device is being used on campus with several patients following ACL reconstruction to their knees. He says this latest therapy modality is being used more widely following knee surgery, including anterior cruciate ligament reconstruction, as well as rotator cuff, hip and ankle surgical procedures. University Doctor of Physical Therapy (DPT) graduate students who will be presenting their research at the upcoming conference in January are Matthew Aitken ’17, Edison, New Jersey; Omar Amer, Scotch Plains, New Jersey; Berta Carmo, Parsippany, New Jersey; Sophia DiCamillo ’17, Abington; Christine Kiefer ’17, Wantagh, New York; Dannylyn Manabat, Long Beach, California; and Jonathan Mayes, Dublin (PA). Physical Therapy Professor Peter Leininger, Ph.D., demonstrates BFR therapy using the BFR Delphi unit and light-load exercise with a tourniquet with the help of DPT student Stephanie Klug, Mooresville, North Carolina. BFR therapy has been shown to greatly hasten the rehabilitation process. Dr. Leininger is currently the only physical therapist in the Scranton area certified in BFR. Peter Leininger, Ph.D., assistant professor of physical therapy, demonstrates blood flow restriction (BFR) therapy using the BFR Delphi unit and light-load exercise with a tourniquet, which has been shown to greatly hasten the rehabilitation process. Dr. Leininger and his students will present their BFR research (a systematic review) at the annual American Physical Therapy Association’s national conference in Washington, D.C. in January. 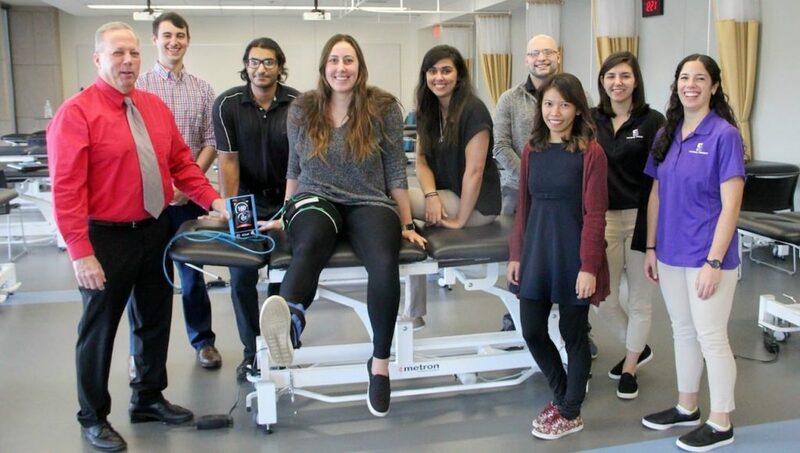 From left: Dr. Leininger and DPT graduate students Matthew Aitken ’17, Edison, New Jersey; Omar Amer, Scotch Plains, New Jersey; Stephanie Klug, Mooresville, North Carolina (demonstrating the therapy); Berta Carmo, Parsippany, New Jersey; Jonathan Mayes, Dublin (PA); Dannylyn Manabat, Long Beach, California; Christine Kiefer ’17, Wantagh, New York; and Sophia DiCamillo ’17, Abington.